But many avoid death now as the greatest of evils but then welcome it as rest from things in life. The wise neither declines life nor fears not living; for life does not offend him nor does he believe that not being alive is bad. Just as food is not chosen only for the larger portion but for the more pleasant, so the wise enjoy the time that is not longer but happier. We enjoy our weekly visit to the Del Ray Farmers’ Market. Of course, we see Tom the yogurt and cheese guy, the lady with the apple cider doughnuts, and the salteña lady. After missing the Lee Brothers’ seafood truck last Saturday, we are very happy to see them again. Over the past few weeks we’ve bought and enjoyed (twice) their hyper-fresh, sweet, and delicious perch filets and once served sake with their oysters. 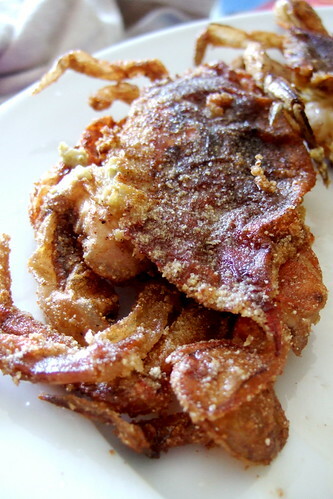 Today we bought already dressed softshell Maryland crabs. For lunch I patted a few with just a dusting of Old Bay and cornmeal and pan fried them. I also shelled fresh peas, a brief steam, a bit of butter. Carlos had to be off on a work errand, so I was alone for my meal. I meditated, chewing happily on two of the great and most simple delicacies of this lovely planet. Damn! It looks like I’ll need to pay off those credit cards after all.